We really love what we do and we want to share it! We provide a friendly, familial atmosphere with the focus on developing our students’ self esteem through success in the classroom; that’s a fancy way of saying we’re having fun while we teach and learn! We are dedicated to teaching the art of dance for the purpose of physical and emotional and mental development, self-esteem and confidence building and the sheer joy of movement to music. We offer many opportunities to share our joy of dance through seasonal tours, special events and our annual recitals. 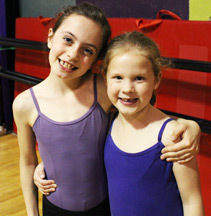 Center Stage Dance offers dance instruction for the Northville Parks & Recreation programs. Classes run in fall, winter, and spring sessions and drop-in classes over the summer. Fall, Winter and Spring sessions end with a showcase for friends and family. Please note: children must be of qualifying age by first class. All classes are held at our studio. Separate registration through the Northville Parks & Recreation Department is required for these classes. Contact them at 248-349-0203 for information. We believe in encouraging our students to get involved in the community-at-large and to use their talents to help enrich the lives of others. We offer a variety of opportunities including tours, special events, and charitable causes. We opened our doors in 1988 in a two-room studio in Walled Lake. In the fall of 1992, we moved to Cady Street in downtown Northville where we happily spent 10 years. As our programs expanded and our student body grew, our need for more space prompted us to relocate in 2002 to our current (much larger) studio on West Seven Mile Road.